Firstly an apology. I have not been feeling too well lately and I haven't been able to get around to commenting on peoples blogs or posting on my own, so please accept my apologies and I hope normal commenting will resume as soon as possible. I know this is a long post but please read it and join in this fun event, it is for a worthy cause. The only rule is NO GLITTER or SPARKLIES if this comes off on the soldiers clothes or skin it can be detected. CJ will then get all of your cards off to the person that will be distributing the cards to the soldiers at war to fill out, sign and send home to their Families and Friends. The soldiers at war do not have access to simple things that many of us take for granted like Christmas and Holiday Card's. This is a campaign so please make and send as many cards as you would like to the address above. All of your cards will then be sent out to be distributed to the soldiers. We will collect cards for about 2 weeks, so please get them out to CJ. This is such an incredible way for the card crafting community to get involved and make the world a better place. This week we are having a 1st place and 2nd place along with a TOP 6. Celebrating this campaign with us this week we have two fabulous sponsors. Whimsy Stamps and Whiff Of Joy Stamps. 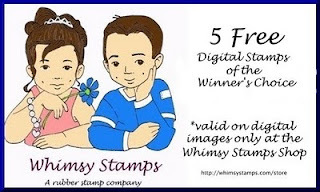 1 image of choice from CJ at Cowgirl Up Designs along with the Winner Badge to display on your blog with pride. I have used a Meljen Design from Whimsy Stamps. This is a lovely image to work with and could be used for many different card both male and female. I coloured it with Copic Markers and Promarker. The snowflakes were cut from a MS border punch and the sketch is from Inspirational Card Sketches #82. We are looking to collect as many hand made cards as possible so spread the word and ask your friends! Copy this badge and make a post on your blog inviting crafters. Post the Badge on your side bar. Leave a comment on the challenge blog that you have done this. We will be hopping around to check and someone will win a special award!! Hello Poppet. Your card is gorgeous. Such beautiful colours and a great design. I hope that you are feeling better very soon, you take care and come back when you are ready. We will be here for you when you return. Poppet - Hope you continue to feel better! I love your card. I really like the color blocks with the image in the center. Hi Poppet your card is really lovely and what a good idea it is to send to the soldiers too. Love the card Poppet the colours are just beautiful!! Hi Poppet hunni 1stly I hope you are feeling better soonies, hope you are getting pampered & looked after hun. This card is lush & I think you are right about it being suitable for man or woman, its yummy...I also luuurrrvvveee your snowflakes they are sooo pretty, I have a thing for snowflakes. Take care hun, get well soon. Sorry to hear you've not been well. Hope you feel better really soon. Love your card! This is a fab image and the colours are gorgeous. Cute card, love the color blocks and snowflakes. Thanks for joining us at Fussy and Fancy. Great card the image is fab, love it. Nice to see you yesterday, hope you get things sorted. Poppet! I love this sweet and adorable image you used! Super cute!! Hi Poppet, sorry to hear that you have not been well. Your card is lovely, thats a great fun image!